Our first spirit, Solid Granite Vodka, is handcrafted in small batches and artfully distilled from corn grown within 125 miles of the distillery. 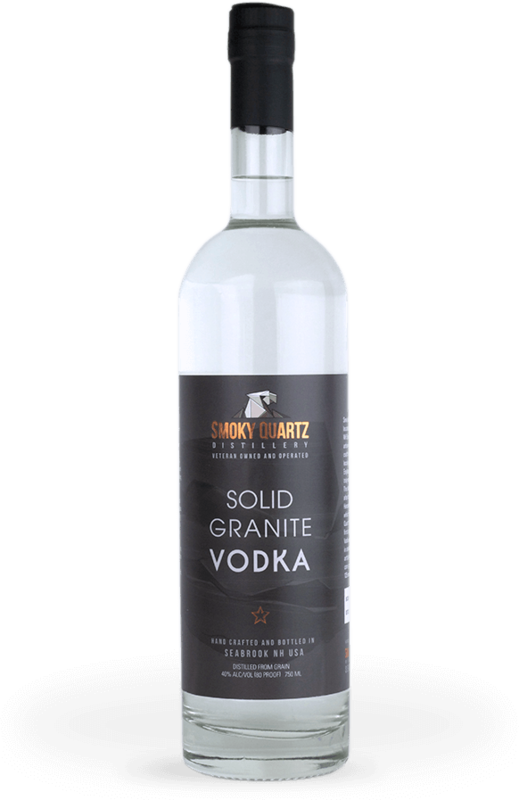 The name “Solid Granite” derives from its status as a new vodka created from fresh local grains, fermented ourselves, distilled ourselves and bottled ourselves using pure New Hampshire spring water. This is vodka with character! Try it neat, on the rocks or mixed, each style helps you discover its myriad complexities. Add Vodka and cranberry juice to mason jar or glass filled with ice. Crisp, sweet opening note which it owes to the 100% organic corn mash. Lightly balanced taste that mixes well with other light tastes like lime or mint, thanks to the use of New Hampshire spring water. Natural sweetness which makes for a great contrast in a Bloody Mary. Clean, no burn finish as a result of slow charcoal filtering–drink it neat!